The ribbon symbolizes unity, of which each individual colored piece is an essential part. It’s one of the most recognizable symbols; yet, it represents a complete mystery. A jigsaw puzzle is made up of many interlocking pieces. Each piece is a different color. Each piece has a place and must be included; the big picture is incomplete if even a single piece is missing or left out. Furthermore, a tied ribbon is a symbol of both remembrance and hope, both essential ingredients to understanding and respecting. 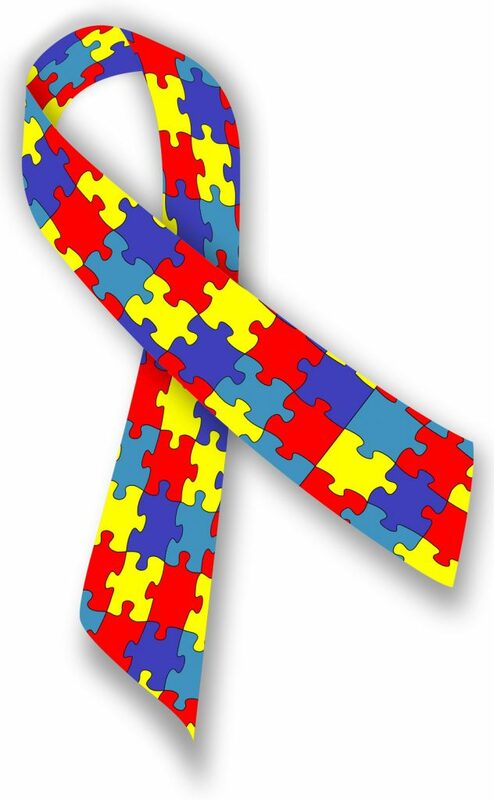 The ribbon symbolizes solidarity and hope of a happy, fulfilling life for people with autism. Autism awareness and acceptance! It has been said, “When you have met an autistic person, you have met a person with autism.” In other words, though this condition has a single name, no two people with autism are alike. The variety of colors reflect are symbolic of the colors of the light spectrum, the many “faces” of autism that have led to the term autism spectrum disorder (ASD). People “on the spectrum” range from nonverbal to intellectually brilliant. Every year, in the beginning of April, people around the world observe World Autism Awareness Day. (Autism Awareness Month comes in October.) The theme this year is “Assistive Technologies. Active Participation.” According to the United Nations, “For many people on the autism spectrum, access to affordable assistive technologies is a prerequisite to being able to exercise their basic human rights and participate fully in the life of their communities, and thereby contribute to the realization of the U.N. Sustainable Development Goals. 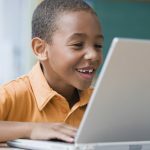 Assistive technology can reduce or eliminate the barriers to their participation on an equal basis with others.” For people with autism and all other disabilities, assistive technology is the key to full participation in society. Most of the assistive technology for this population consists of organizational apps, augmentative and alternative communication (AAC) devices, and a host of social skills programs. At the United Nations in 2008, the world came together, holding its first World Autism Awareness Day. Now, eleven years later, the objective resounds loud as ever. This global awareness day reflects the values of the U.N. Convention on the Rights of Persons with Disabilities (CRPD), which proclaims a “respect for the inherent dignity, individual autonomy including the freedom to make one’s own choices, and independence of persons… and full and effective participation and inclusion in society” for people with all disabilities. Autism Awareness Month first came to be about 25 years ago, when the Autism Society of America undertook an effort to promote autism awareness. 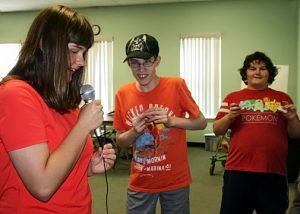 The primary objective was to “promote … inclusion and self-determination for all, and assure that each person with ASD is provided the opportunity to achieve the highest quality of life.” Autism awareness is a good thing, but autism acceptance is far more meaningful. The idea is to accept people for who they are and to understand and embrace their differences. According to the Autism Society of America, “Autism acceptance means embracing and valuing autistic people as autistic people instead of being afraid of us, having low expectations, or trying to find a way to make us not autistic.” It also entails making both autism awareness and acceptance part of our everyday lives, well beyond the month of April, continuing throughout the remainder of the year. Many of the children in our community-based respite program are on the autism spectrum. They often show considerable creativity. Here, they also learn about taking turns. 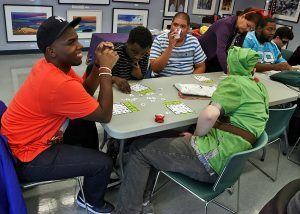 Participants in our Weekend Recreation program, many on the autism spectrum, distinguish among fine shades of meaning in a holiday-themed game of bingo. Accepting people with autism honors human diversity. 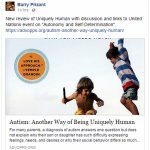 Barry Prizant, author ofthe landmark 2016 book, Uniquely Human: A Different Way of Seeing Autism, presented autism acceptance. His primary objective is to accept autistic behaviors, such as echolalia and stimming (hand flapping) as way in which autistic people deal with stress and self-regulate. These behaviors are not symptoms of a disease and should not be repressed or otherwise “managed.” Awareness and tolerance are passive; autism acceptance, on the other hand, is active. 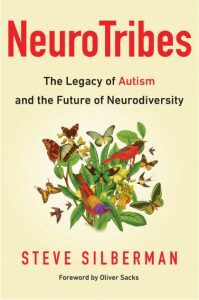 Steve Silberman compiled and wrote Neurotribes. 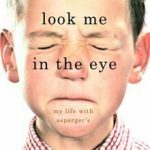 Not only is this book a comprehensive history of autism, it laid the foundation for neurodiversity, that autism is a different way of perceiving and reacting to the world. As with the colored puzzle pieces of the autism ribbon, autism is a single name applied to a highly diverse group of individuals. Mr. Silberman continues to be a very strong advocate for people on the autism spectrum. The idea that people have the right to define themselves on their own terms is a reflection of the author’s long-time work in the LGBTQ community. 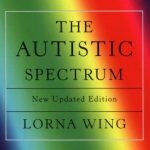 The very idea of autism being a spectrum is the result of the work of Lorna Wing, a British researcher. This notion is at the heart of neurodiversity and autism acceptance. 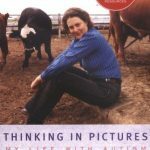 The two most recognized autism self-advocates today are Temple Grandin (Thinking in Pictures) and John Elder Robison (Look Me in the Eye). 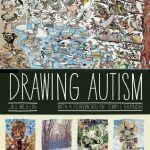 Drawing Autism is a curated collection of art by people on the autism spectrum, one that is as diverse as the artists who created it.